A day after Turkish prosecutors issued an international warrant for his arrest, NBA star Enes Kanter skipped a game in London, citing fears he could be killed by the Turkish government. A day after Turkish prosecutors issued an international warrant for his arrest, NBA star Enes Kanter skipped a game in London this week — citing fears he could be killed by the Turkish government. Kanter says he's being targeted for his place as an outspoken critic of Turkish President Recep Tayyip Erdogan, who he has previously called "the Hitler of our century." Despite his place as a public figure, both he and the New York Knicks organization believed the threat to his life serious enough for him to stay in New York and not risk the trip to Britain. The Knicks went on to lose the game to the Washington Wizards Thursday by a single point. "The reason I didn't want to go is because I was scared for my life of President Erdogan's operations in Europe," he told CBC News. "The Turkish government are famous for hunting down people who speak out against the government. Erdogan's long arms are everywhere. I didn't feel safe." Kanter is a follower of Fethullah Gulen, a Turkish Islamic cleric, dissident and former Erdogan ally who has been living in the Poconos region of Pennsylvania for nearly 20 years. The Turkish government considers Gulen a terrorist — blaming him for organizing and funding a bloody 2016 coup attempt that left 251 people dead. Kanter, who was drafted by the NBA in 2011 and has played for the Knicks since 2017, played for the Turkish National team at the FIBA European Championship in 2008 and 2009 and for the 2011 EuroBasket. He has permanent resident status in the U.S.
Kanter, like Gulen, lives in exile in the United States, and says his close relationship with the cleric has given him a piece of home he wouldn't have otherwise. 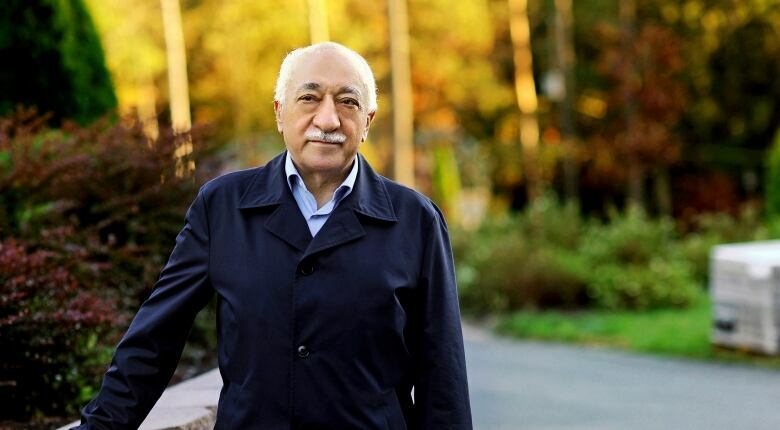 "I cannot go back to Turkey, so every time I go visit Mr. Gulen it's like I'm going home," he said. "I would say he's like family to me." Since 2016, tens of thousands of Gulen's followers and those educated in his schools have been arrested in a series of co-ordinated raids in Turkey, stemming from allegations from Turkish authorities that they were supporters of terrorism. The post-coup purges are still ongoing and more than 70,000 people have been arrested thus far. Although living in rural Pennsylvania, Gulen continues to maintain a considerable influence on public life in Turkey, and Kanter has been a follower of Gulen's since attending "Gulenist" school as a child. Their relationship is so close that Kanter watched the 2016 coup attempt in Turkey from a couch in Gulen's home. "We were all shocked. I saw him with my own eyes. All he did was sit on his chair and pray for his country," Kanter said. "And then later Erdogan came out and blamed Gulen's movement for the coup attempt and I was like, 'I was with him that night; I saw with my own eyes what he did.' That's why I was very frustrated." The Turkish government has spent years petitioning for Gulen's extradition back to Turkey, but their bids have been unsuccessful and complicated by his status as an American resident. In 2017, former U.S. national security adviser Michael Flynn was accused of co-ordinating a covert extradition effort of Gulen on behalf of the Turkish government. Last December, Turkey's foreign minister said U.S. President Donald Trump told Erdogan after a G20 summit in Argentina that Washington was working on extraditing Gulen. "The Turkish government has been trying to extradite him for five years. The thing is, he's an 80-year-old man that lives a simple life in Pennsylvania," Kanter said. "There are rules, and there are laws in America, so there's no way they will send him back to Turkey." All of this has culminated in what Kanter sees as a deliberate campaign, led by the Turkish president, to target him and his family for his political views. In 2017, Kanter was detained for hours in a Romanian airport after his travel documents were cancelled by the Turkish government. Kanter, who hasn't seen his family since 2015, says his home in Turkey was raided in 2017. "They wanted to see whether I was still in contact with my family or not," he said. "And if they were to see a single text, like, 'Hi mom,' or a single missed call, they'd all be in jail." Earlier this year, Kanter's father was fired from his job and jailed and now faces up to 15 years in prison over accusations of "membership in a terror group." "He's facing 15 years in jail just for being my dad," Kanter said. "That's the sad part." Turkey announced last month that Hidayet Turkoglu, a 19-year NBA veteran and former teammate of Kanter's, was named "chief adviser" to Erdogan — a move Kanter believes was made to counteract his influence. Turkoglu took to Twitter earlier this month to call Kanter's anti-government position "deluded" and blame his absence at the NBA London game on "visa issues." "Such remarks constitute another example of the political smear campaign Kanter has been conducting against Turkey," Turkoglu said. "It is obvious that this person's remarks are irrational and distort the truth." Kanter says Turkoglu's criticism hit hard. "Back in 2011 we were very good friends, because we played together on the national team, but now he works with the Turkish government," he said. "When your friend comes out and says things like that, it's definitely heartbreaking." Kanter responded on Twitter by saying his decision to stay home wasn't due to visa issues and provided a copy of a travel document he said proved it. He added that it was the same document he's used when travelling to Canada for games against the Toronto Raptors. 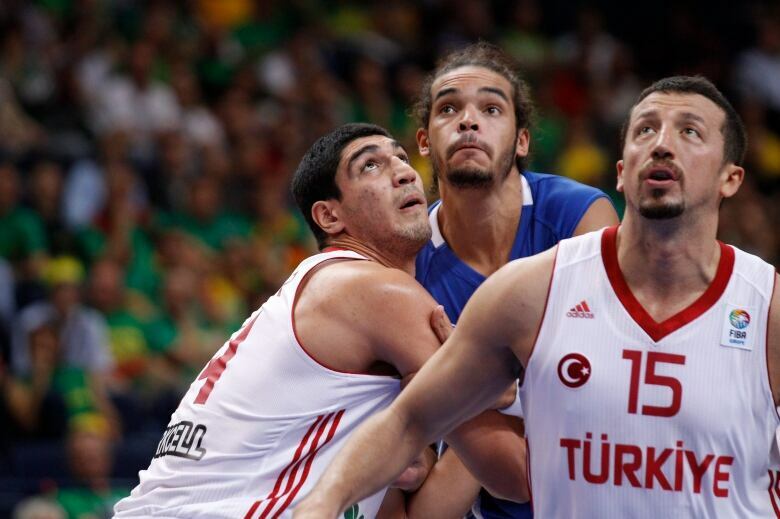 In a tweet, Kanter blasted his former teammate, calling him a "lapdog" of Erdogan. "Now he works for the government, whatever the government says, he has to do it," Kanter said of Turkoglu's statement. "He cannot say no." Since he announced that he planned to forgo his team's trip to London, Kanter said he has been inundated with online death threats. Although he fears direct reprisal from Erdogan's government, he's mostly concerned that supporters of Erdogan may be inspired to take matters into their own hands. He referenced the 2017 clash in Washington between protesters and members of Erdogan's security detail as evidence of this. Video of the incident shows suited men attacking protesters outside the home of the Turkish ambassador in Washington, which Kanter said was proof that nowhere is safe from Erdogan's appetite to silence dissent. "Look at Washington, when he gives orders to some security guards to go beat up some civilians. This is what he's doing in front of the eyes of the world," Kanter said. "There are lots of crazy Erdogan supporters all over Europe. That's why I didn't want to take that chance. It could be a lone wolf that just wants to hurt me." 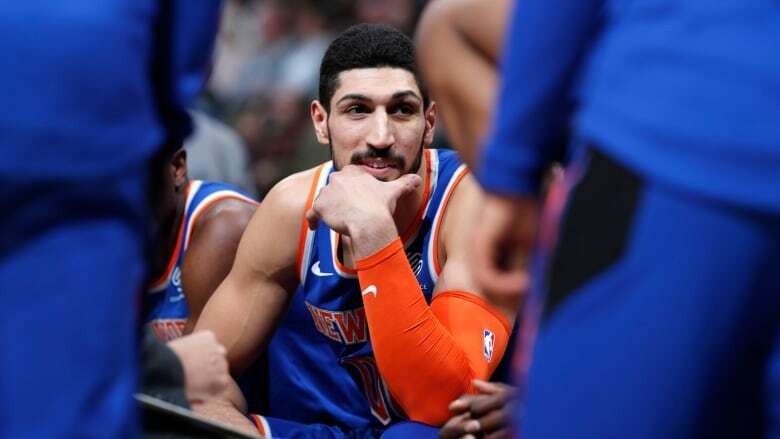 On Wednesday, Turkish state-media Sabah reported that Turkish officials had submitted a "red notice" through the international policing organization Interpol for Kanter's arrest, as well as an extradition request for the NBA player. The Knicks star responded on Twitter by saying he is a "law-abiding citizen" who has never even received a parking ticket in the U.S. It's still unclear whether Turkey's red notice could prevent Kanter from flying again. Such a ban would mean he would no longer be able to travel to Canada for games against the Toronto Raptors. The Canada Border Services Agency said in a statement it "will not speak to specifics" on the case but added "several factors are used in determining admissibility into Canada, including involvement in criminal activity, in human rights violations, in organized crime, security, health or financial reasons." Interpol said it was unable to confirm nor deny reports of Turkey's red notice. This week, Kanter also sat down with some of Washington's power brokers during visits to Capitol Hill, meeting with Florida Senator Marco Rubio and Senate minority leader Chuck Schumer to discuss human rights in Turkey. "When I met with those senators and congressmen and started telling them about human rights in Turkey, they said, 'Don't worry, we already know this stuff,'" Kanter said. "That made me very happy." Kanter said he hopes to meet with U.S. President Donald Trump as well. Issues with Erdogan aside, Kanter said his ultimate goal is to see Turkey become a bridge between what he calls "modern Islam and the West." "But because of the things that've been happening, that's impossible right now," he said. Matthew Amha works with CBC's The National in Toronto. He was a recipient of the 2018 Joan Donaldson CBC News Scholarship.